Adopted on April 8, 1968. The barite rosette or "rose rock" has been the state rock of Oklahoma since House Bill 1277 was approved by the Oklahoma legislature on April 8, 1968, and was signed into law by Gov. Dewey F. Bartlett. 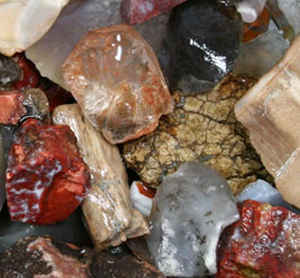 Rose rocks are found in central Oklahoma, although barite deposits also occur in the Wichita and Ouachita mountains. Similar rosettes occur in Kansas, California, and Egypt. 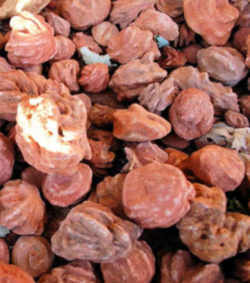 The rose rock is an aggregate of barite and sand formed like a fully bloomed rose, with five to twenty radiating plates or blades that appear as the petals. In the 1960s rock and mineral collectors campaigned for the barite rosette to become Oklahoma's state rock. Their petition drive resulted in a bill proposed in the state House of Representatives and subsequently enacted in 1968. Always attractive to rock hounds, rose rocks thereafter became very popular and marketable in tourist venues. The Rose Rock Museum, established at Noble, Oklahoma, in 1986, showcases original art work that includes rose rocks. A Rose Rock Festival has been annually held at Noble. 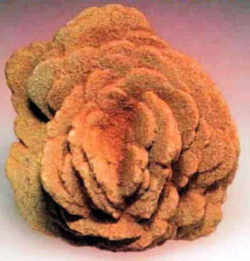 Sometimes called the "barite rose" or "sand barite rosette." Rocks resembling full-grown roses were formed by barite rock crystals during the Permian Age (250 million years ago) when ocean waters covered the western half of Oklahoma, and the counties of central Oklahoma were under shallow bays. 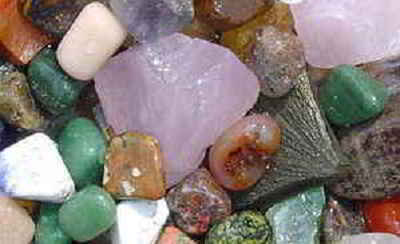 Over time, barite (barium sulphate, BaSO4) precipitated out of sea water and crystallized around grains of quartz sand. 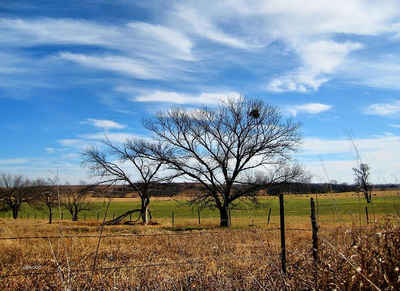 Over eons, the ocean retreated westward, and a geologic formation of reddish sandstone, locally called the Garber sandstone, was left in a broad band across central Oklahoma. In Oklahoma, the distinctive red soil colors them in hues ranging from reddish brown to cinnamon. An old Cherokee legend says the rocks represent the blood of the braves and the tears of the maidens who made the devastating "Trail of Tears" journey in the 1800s to Oklahoma. They have been reported in small quantities in California, Kansas, and Egypt, but are in greatest concentration in the Permian Garber Sandstone in a narrow belt that extends 80 miles through the central part of Oklahoma between Pauls Valley and Guthrie. The most abundant and well-formed specimens are found in an area just east of Norman, near Noble, also known as the "Rose Rock Capital of the World". The cluster, found 20 miles southeast of Norman, Oklahoma, is 62 inches long, 24 inches high and 18 inches wide. It weighs 788 pounds and required three months to extract intact. Named "Redwine and Rose" for its finders, Tom and Ann Redwine, the final removal and cleaning of the specimen took the efforts of four men over a two-day period. An Act designating the Barite Rose as the official State rock; directing codification; and declaring an emergency. 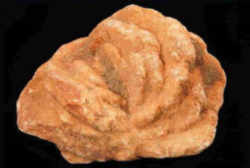 The Barite Rock, commonly know and referred to as the "rose rock", is hereby designated as the official rock of this State. Section 1 of this Act shall be inserted in the Oklahoma Statutes as Section 98.1 of Title 25. Approved April 8, 1968. Emergency.